We’re just catching up here after some health issues cascaded into the Newport Show cascading into our website having to be moved and updated into… well, here we are now. Whew! We’ve reviewed many of JV’s show reports in the past, where we have heard what he has heard, read what he has to say, and posted our own two-cents on the matter. Based on several of these I think we know where JV is coming from, when we will likely agree with him and when he likely exaggerates, and what his overall sonic preferences are [very, I would say overly, neutral sounding, similar to, but not as extreme as, JA and Mike Fremer] . We’ll start off with the controversial Magico room. I strongly believe this is JV’s honest opinion and it is very probable that we would have had the same opinions, but with the caveats and clarifications below. If you’ve read a number of JV’s past reports, you know he isn’t very fond of horn speakers. They really have to ‘prove themselves’ to be ‘unhorn-like’ in all ways. I think he recently [this year or last] actually liked a horn speaker, but over the years, he has disliked horn speakers that we have found perfectly acceptable – that is their trade-off of increased, much more life-like dynamics in exchange for a little loss of resolution X and a little discontinuousness Y with the slower conventional bass drivers works just fine and stays within the bounds of ‘sounding like music’. At least to our brand of very picky ears they do, anyway..
As for ‘X’: One might expect the SYSTEM in the Magico room to be of less resolution than other rooms because the Pass Labs First Watt amp is very pure sounding, but a little low on resolution [I’m not familiar with the Pass Labs preamp here]. 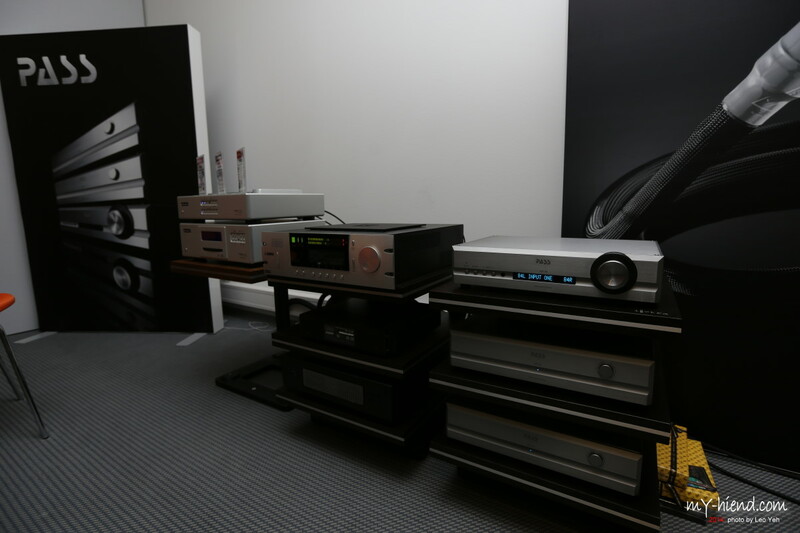 The source here, the EMM Labs TSDX and DAC2, we are of course glad to see these in this system, as it would be hard to find something better. Not sure what cables they used here. As for ‘Y’, the Magico horns go down to 120Hz, where the conventional woofers kick in to provide the bass down to 20Hz, which is freaking low. Integration is still an issue, unfortunately, especially if one wants to avoid just going the route of just making the woofers have a lot of [often too much] punch to please the basslover in all of us, like several much beloved and very successful speakers do as they mate their bevy of different technologies to conventional bass drivers. Others try to go for the gold. Acapella, for instance, reduces the efficiency of their horns somewhat, and increase the efficiency of the conventional woofers somewhat, in order to make the two technologies sound all-of-a-piece. Not sure but I think Magico uses DSP to mate their horns to their conventional woofers, which should also work quite well it seems to me. * cupped-hands coloration: just know that this would have had to have been perfect, in this room, for JV to have given it a pass in this respect. * aggressively projected midband: So this meant that there was not enough air, not enough mid-range resolution, and not enough bass. As for the bass, I saw that Alon was there in Fremer’s walk-through video, and I have observed over the years that he likes to play with the frequency response of his show systems to minimize bass overhang – often resulting in too little bass for many people [we actually agree with this approach, but our rooms at shows also get dinged for having a little less bass than what people hear in other rooms]. Not sure why there was a problem with the ‘air’ / high-frequencies – many cables roll off the highs to make most systems sound ‘not bright’ – but don’t know if that was the case here. 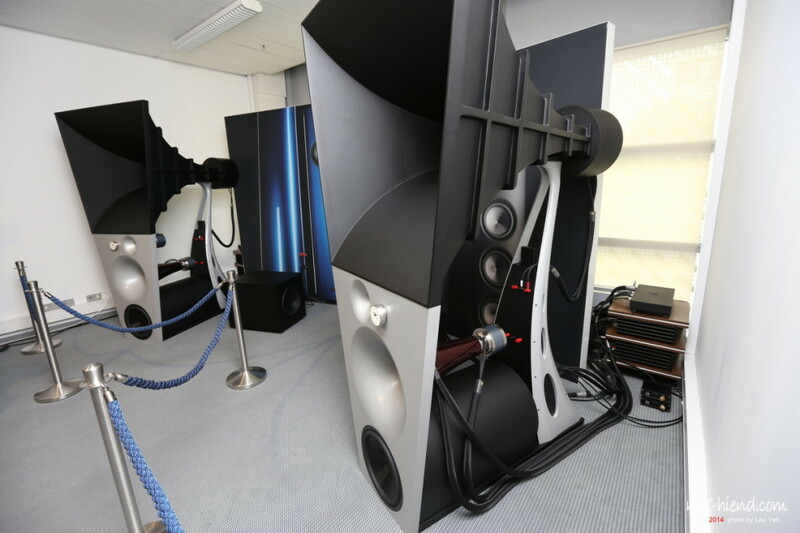 The midrange resolution is going to be down a little bit due to the amp being the First Watt – especially at loud volumes which some people say was up to 100db. * zero image focus: again, a problem in the high frequencies, 5000hz and above most likely. Maybe those walls absorb high-frequencies? They look weird to my U.S.-centric eyes. * slightly discontinuous bass: we talked a little bit about this [ ‘Y’ ] above. Hard to say much about this – rooms at shows? bass? Hardly ever a good match. * made many acoustic instruments sound as if they’d been electronically reprocessed. Yikes. There are a lot of speakers out there that change the sound of instruments enough that it is hard to tell what they originally were. We probably all have a few on our ‘favorite speakers list’ [including JV. And we won’t go down the list of speakers, or amps, that do this]. But it would not seem to be a inherent problem with the design of the Magico Ultimate III Horn to me. JV hints that he thinks it is the DSP [digital signal processing] in the Magico horns. He may be right, but it is a newish technology and it is going to take the blame for a lot of sonic problems in the next decade or so, which it may or not be the cause of. 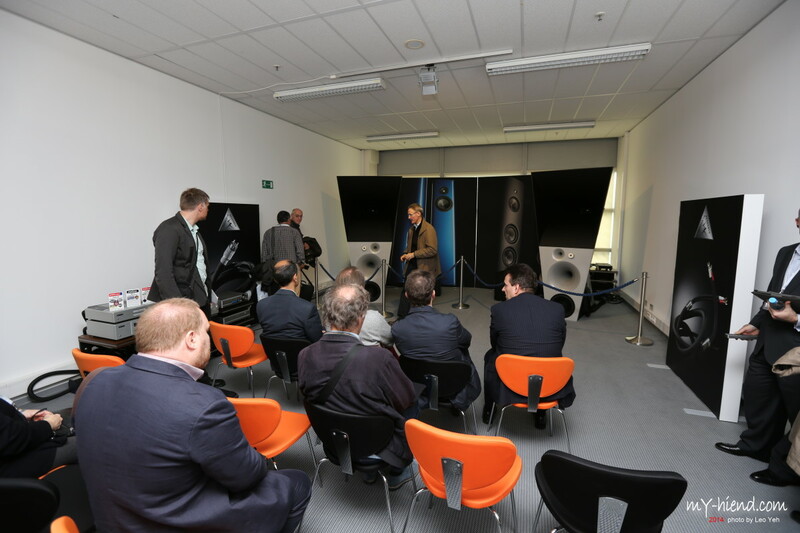 JV’s Visit to the Magico Factory to hear their Ultimate III horn speaker again. Makes sense that Magico would try and prove to JV that it was a show anomaly and not the speakers responsible for the problems he heard. Makes sense that JV would go when invited. I do think JV was under some pressure to say nicer things about the speakers here. But we can still learn something from what he wrote. Essentially, he still found it ‘digital sounding’ and still blamed the speaker’s DSP ‘crossover’. First, all systems that use a digital source are ‘digital sounding’. Some more so. Some less. JV likes many of these systems, and is more forgiving of ‘digital sound’ than we are – so this must be REALLY annoyingly digital sounding. Second, these speakers at 114dB sensitive are like a electron microscope on the upstream components [not so dissimilar to a diamond midrange]. It really matters what the rest of the stuff in the system is. I like the design of the Magico system in Munich [but at a lower volume. Wouldn’t be as impressive, maybe, but I try and be kind to my ears. I like them. A lot.] 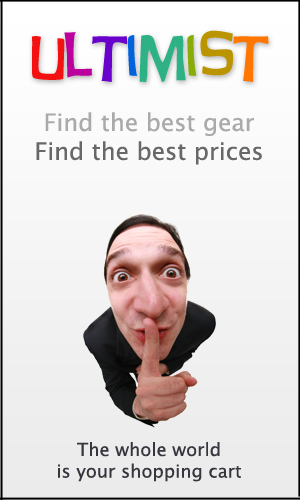 – and hate the one in their factory showroom. We like the Magico speakers well enough, but for many of their demonstration systems, we wouldn’t want to hear them with any speaker. So, what JV heard as ‘digital sounding’ could just be the usual garbage that a lot of gear puts in the signal that most systems cover up [often through overly-forgiving speakers or dull-sounding cable], and many people cannot hear or just think “That’s just the way that really high-resolution expensive gear sounds”. 1. Point the speakers straight ahead so no one is getting blasted by the full force of the center of the horn mouth. Many speakers, including box speakers with any kind of solid front baffle, generate a peak in mid range energy if you listen to them straight on. I know some disagree, but I do not like the ‘public address system’ effect very much at all. 2. Don’t play it so loud. 3. OK. Yes. One should put an excellent-sounding tube amp on these [you knew I was going here? Sure ya did ;-)]; along with cables that preserve the resolution, the bass, and the highs; and a decent source. Disagree with Romy that the Lamm ML3’s 30 watts would be mostly wasted; the idea is that more watts are always better if one does not have to sacrifice quality to get them – the added bandwidth on transients IS audible and to be preferred. A little 2A3 amp might be nice as well. Now… on to the media part of the presentation. After listening to a lot of these show videos now – you CAN hear a lot about the sound. It is all about comparing with other show videos and what THEY sound like. Here you can hear the purity and the ability to keep up with small and large dynamic swings very, very well. You can also hear the slight lack of [artificial? But now commonplace] resolution and … well, I’ll have to listen to it some more. HifiClube has a few videos as well: Magico Ultimate III at Munich 2014. Here you will hear that, yes, they did play disgustingly audiophile crap here at least some of the time. Can’t tell poop about the speakers with these kinds of songs, IMO. 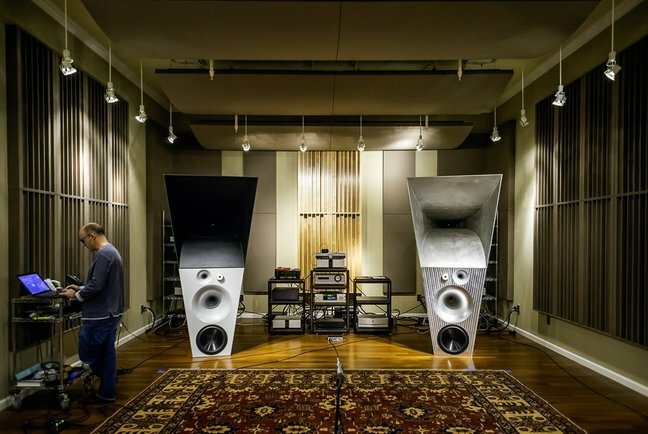 Look how toed in these speakers are. Look how live the room is. Think maybe that is a lot of energy coming right at the listeners? Like maybe this poor guy in the back in the suit… he should move off to one side. The EMM Labs and Pass Labs front end. Looks they were using [Magico’s] digital source as well. Hmmmm…. So. Obviously a statement loudspeaker. Looking at how it is designed, and at setup, and at upstream components, and a couple of good reviews by a reviewer you understand, one can start to get a feel for what the speaker can do and not do. For example, no matter how expensive a speaker is, it will NOT ALWAYS sound great- it is still going to be sensitive to environment / room, setup, and the hi-fi system it finds itself in. Then again, it is going to sound a heckuva lot better than just about everything else on the planet once you get it all setup optimally and happy happy. I want to say it was a good idea you put you and neli picture at first page of your site. I plan on posting a part II to this Munich report, talking about the other rooms there and what was and was not said about them. [I liked your comment on JV’s report about how, to paraphrase, business concerns were negatively impacting his ability to do a quality show report].